I love, love, love the First Lady! If I can ever be accused of being biased it woud be fair to say that about me and Mrs. Obama. So I was delighted to see a pair of high profile appearances from Mrs. O this weekend. Michelle and Jimmy created another cute video to promote her “Let’s Move” campaign showing off “Mom dances”. I bet Mrs. O is waaaay more hip than she lets on, but it was still very entertaining. Jimmy was also quite convincing in his mom drag. Can you imagine any other First Lady dancing alongside a man in drag on national tv? Pretty cool! Then on Sunday in what seemed like a marathon Academy Awards (seriously could it have dragged on any longer? Ugh), the big pay off came in the Best Picture category. 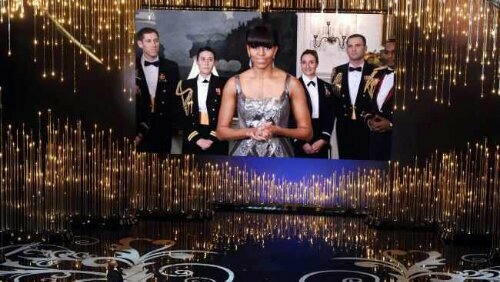 Of course it is naturally the most anticipated award of the night, but the real surprise was when Jack Nicholson introduced the First Lady live from the White House! After Jack recapped the nominees Michelle read off the winner and congratulated Argo. Now I already admitted I’m a lil biased but I can’t think of it getting any bigger than the First Lady of the United States announcing you as the winner (well unless the President himself announces it). Congratulations to all the Oscar winners (Poor Jennifer Lawrence for falling) and special shout out to nominee Quvenzhane Wallis. Stay fabulous darling and don’t let the negativity overshadow your tremendous accomplishments and talents. What Is Going On With Lil Wayne? Did Beyonce Really Give Birth to Blue Ivy?